Welcome back to another installment of our Create-A-Greeting-Card Scholarship Contest Look Back Series. The 2008 scholarship was our second run and we were all excited and ready to get going. Clearly there was alot of excitement from our first scholarship contest and boy was it evident in the final number of submissions which totaled over 11,000! 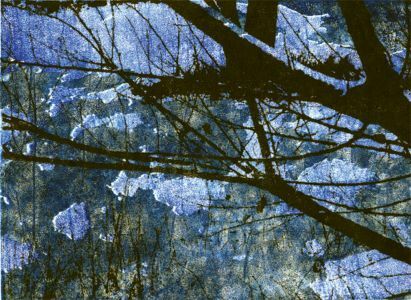 There were so many beautiful entries to choose from and in the end, George Humeston was selected as the winner for his beautiful painting depicting a stunning winter night scene with snow covered tree branches. After the entry was selected as the winner, our artists turned it into the stunning Full Moon Winter Night Christmas Card. There wasn’t much that had to be done to the entry itself for it to be turned into the card but we did add some enhancements. The card was stamped with silver refractive foil and enhanced with some embossing (raising some details of the image to give it a three dimensional effect). 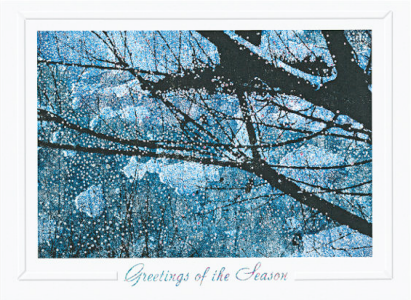 Falling snow was added in with the use of silver foil dots to really drive home the winter scene feeling. A white frame was also added around the image to give it the framed painting feel. It was a beautiful entry which easily became a beautiful card in our line. That’s a painting? It looks like a photograph. Love what the art department did with the silver foil enhancements –stunning! This is a beautiful work of art turned into a greeting card. It is amazing what enhancements can do with something that is already a masterpiece. I find it amazing to see such talent! First with George Humeston, the winning artist, then with the designer who enhanced the painting. Talent like this is innate, you can’t learn it-I tried! Congratulations George and I am looking forward to seeing more of these Look Back Series. Next post: Happy Labor Day From The Gallery Collection!